For complete information, please contact Kidde toll-free at 855-271-0773 from 8:30 a.m. to 5 p.m. ET Monday through Friday, 9 a.m. to 3 p.m. 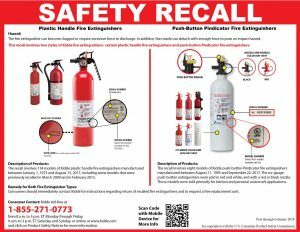 ET Saturday and Sunday, or online at www.kidde.com and click on “Product Safety Recall” for more information. Hazard: The candles’ high flame can ignite the surface of the wax, posing a fire hazard. Consumer Contact: Cost Plus World Market toll-free at 877-967-5362 from 7 a.m. to midnight ET daily or online at www.worldmarket.com and click on “Product Recalls” for more information. Description: This recall involves Cost Plus World Market’s bleeding drip taper candles sold in a pack of two candles. The unscented wax candles are black and bleed red wax as they melt. They measure about 10 inches long. World Market, Bleeding Drip Taper Candles and SKU/UPC 544668/000000544668 can be found on the product packaging. Incidents/Injuries: The firm has received two incident reports, including one of a candle catching on fire. No injuries or property damage have been reported. Sold At: Cost Plus World Market and World Market stores nationwide and online at www.worldmarket.com from August 2017 through October 2017 for about $7. Importer(s): Cost Plus Management Services Inc., of Alameda, Calif. Hazard: The bowl base of the fire pits lacks a heat shield to protect consumers from burns while turning off the propane tank after use, posing a burn hazard. Consumer Contact: Yayi toll-free at 855-600-9294 from 8 a.m. to 8 p.m. ET Monday through Friday or by sending an email to customercare@china-yayi.com or online www.china-yayi.com/ and click on Recall for more information. Description: This recall involves Hampton Bay 50,000 BTU, 30 inch Cross Ridge Outdoor Gas Fire Pit Table Patio Heaters with model number G-FTB51057B and UPC 6944937601579. The fire pit has an antique bronze finish with a natural slate tabletop and a black base that holds a propane tank. The model and UPC are printed on the product’s packaging. Incidents/Injuries: The firm has received three reports of consumers who were burned while turning off the propane tank after using the gas fire pit. Sold Exclusively At: Home Depot stores nationwide and online from August 2016 through November 2017 for about $200. Importer(s): Home Depot Product Authority LLC, of Atlanta, Ga. Distributor(s): Home Depot Product Authority LLC, of Atlanta, Ga.